Aw, he's cute!!! Too bad he and his lil' buddies are devouring my pretty blue ornamental cabbage. I picked off all the worms I could find yesterday, and tossed them in the yard as far away from the garden as I could (they turn into the Cabbage White butterfly so I didn't have the heart to kill them). My edible cabbage in the back garden has also been devoured, and although I can't find any worms, I do recall seeing these lovely little white butterflies flitting about (ah-HA!). The butterflies deposit their small eggs on the underside of the leaf. After a short time (about a week), the eggs hatch and the worms start munching away, nourishing themselves to make their chrysalis for the next generation of butterflies. Use floating row covers and/or nylon stockings to cover your plants. Remove and destroy the worms (does throwing them across the yard count? I'm thinking not, lol). Plant other things to deter these pests (such as RED cabbage, Mint, Sage, Rosemary, Thyme or Hyssop). Catch the butterflies with nets or sticky tapes. They also sell their organic insectide, which is another option to try. Another spray option, which I might try because I can mix it myself and is chemical free, is the combination of 1% garlic, 1% fish oil and 98% water. You can visit this site for more information on this. Flour, dusted on the leaves when they're damp from dew or rain, also works. The worms eat the flour, become bloated, and die. I'm considering trying this as well, since it's a totally non-toxic option. This e-How article by Chris McLaughlin describes the flour method. 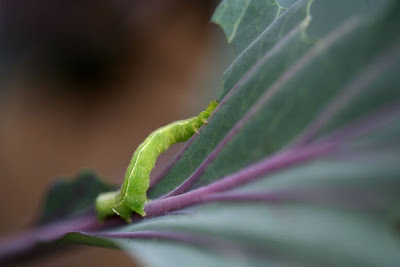 There are many things you can do to combat the Cabbage Worm - I'm planning to add to this post as I come across more information. Meanwhile, I guess I'll try one of the remedies described above and see what works!